While adding the ear mesh, I had to tweak it a bit to pull the top part up and out a bit. 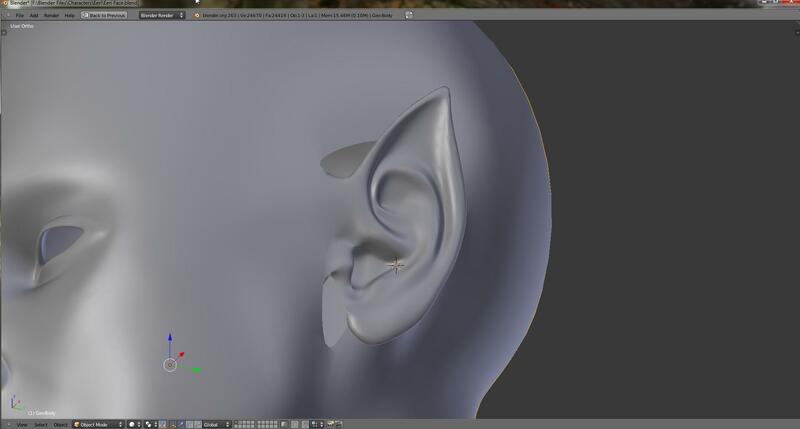 But the ear itself seems to look great, just have to match it up with the edge loops within the model. I only get a few hours a day to work with my drawings, this is what is taking me so long to get the gallery together. I figure by the time Book II is completed, I should have 2 to 3 character drawings along with weapons drawn up an made into 3D models. Just picked up the 3D Connexion mouse, and can say it is pretty sweet. Learning curve ahead with this one too. I can say that it does help in manipulating the model with less keystrokes. I will be adding more pictures of model (Eeri) progress as I complete them.